rural.scapes lab in residence is located at the main house of an old coffee farm, the Fazenda Santa Teresa, in São José Barreiro, at the foothills of Serra da Bocaina National Park, located on the triple border between São Paulo, Rio de Janeiro and Minas Gerais, three economically important poles of southeastern Brazil. A collective studio will be the basis for temporal laboratories, although we consider as laboratory area the whole surroundings of the farm and the region between Silveiras and Bananal towns. 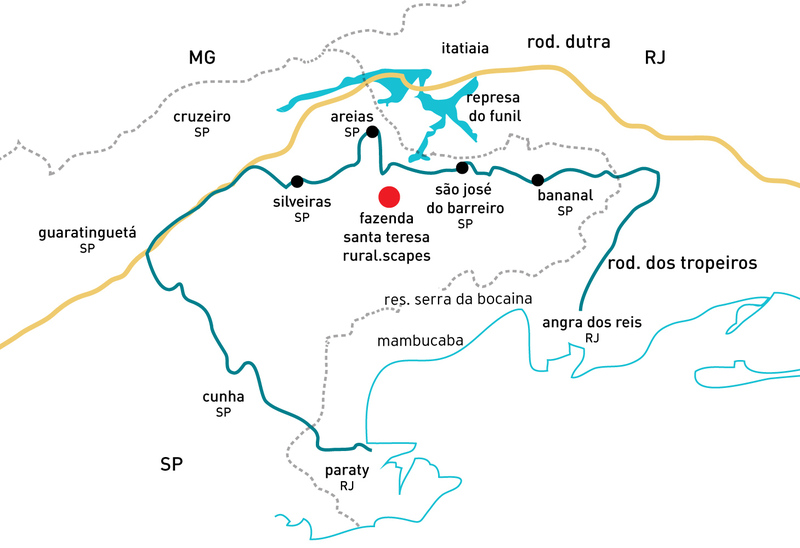 This stretch includes Queluz, São José do Barreiro and Arapeí. The Santana stream crosses the farm, with water coming from Bocaina mountains, showing rapids and pools for bathing. Food comes mainly from local produce: organic gardens, redneck eggs, milk, chickens. Spring water is used. The farm has a ​​remnant native vegetation area as a natural reserve. Communication at the farm via cellular network works through antennas. For internet, the safest access is in the cities of São José do Barreiro or Areias, both 12 km away. Selected artists will have individual bedrooms and living room, kitchen with wood burning stove and two bathrooms for collective use. History and Architecture of the Paraíba Valley region. Rural culture along Tropeiros Road (former Rio-São Paulo Road), located at the Paraíba Valley between Mantiqueira and Bocaina mountains, experiences nowadays a contradiction, while being situated on the border of the most economically prosperous states of southeastern Brazil and at the same time having the highest levels of poor education of the state of São Paulo. As a part of a slavery-based colonial Brazil, the region is today in a state of neglect and abandonment that opposes the memory of a time when coffee brought a golden era. This golden period is still visible in the colonial mansions in towns and old farmhouses. Many of these houses and farmhouses are listed by CONDEPHAAT and/or IPHAN , but not all are restored and/or preserved. Many of these houses requiring restoration have been lost with rural-urban migration, in face of an economy increasingly oriented to services, industry and large scale primary sector. This temporary oblivion promoted indirectly a certain preservation of intangible heritage. Small producers still survive and work based on traditional and artisanal methods, with dairy farming on a small scale, small animals livestock, horticulture, fish farming, basketry, crochet and loom, crafts related to livestock leather, regional country guitar players and seresteiros. In the same way, part of the colonial architecture also remains. This Heritage includes knowledge of traditional production practices, architecture, tropeira cuisine, music and the natural reserve of Serra da Bocaina National Park itself, the largest area of preserved Atlantic Forest totaling 104,000 hectares, and makes this region a fertile environment with great potential for the development of projects that stimulate new productive networks and micro-economies, making this region more self-sustaining and fostering new creative dialogues between city and countryside.